What century are we living in? It might sound ridiculous, strange, and weird, but a career in parapsychology, “angelology,” and demonology has been practiced at Santos Lugares, near Buenos Aires, since March 2016. It is supposed to be the first career that integrates parapsychology with“exorcistic” (?) disciplines. Reminder: we are not in the fourteenth century. “Bishop-Doctor” Father Manuel Adolfo Acuña. Furthermore, Acuña claims to be a Lu­th­eran Bishop, but he is not recognized by the Official Lutheran Church in Argentina. I personally debated with Acuña on several TV shows, on which he talked about religion, paranormal phenomena, and another issues using pseudoscientific jargon. 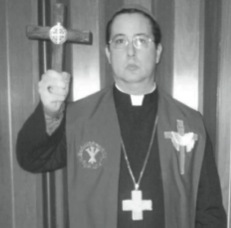 He claims to be an authority on UFOs, ghosts, exorcism, paranormal powers, subliminal perception, etc. I think he knows everything in the whole world! Believe it or not, he’s being consulted by several “serious” journalists on TV, radio, and all media. It’s also remarkable that this career “does not require previous studies,” which means that everybody can attend the classes, no matter what titles they’ve previously achieved. But he offers a title, let’s say a diploma, which is not official. I presume he doesn’t want to have problems with the law, especially with the illegal practice of medicine, which is considered in article 208 of the Argentina Penal Code. Acuña also offers a title supported by the “School for the Personal Integral Develop­ment–Center for the Psychic-Spiritual Train­­­­ing.” Again, not official. The ad says that this title is also recognized by the Inter­national Academy of Theology and the Seminar Santa Sofía and that it’s supported by the Anthropological Center of Cultural Expressions of Rosario, Santa Fe province, Argentina! A lot of support is received from a lot of institutes, centers, and academies. It looks very weird. The length of the career is “approximately” three years. What does it mean by “approximately”? I would like to know. Maybe evil is something not as easy to throw out as you’d think. The final title incorporates the “professional” who attends the career to the “First Inter­national Brotherhood Ecumenical of Exorcists.” Very weird, isn’t it? I have sent an email to Pablo Avelutto, Minister of Culture of Argentina, telling him about my concern with this crazy and potentially dangerous “career.” To the present date, I have received no reply. I wrote him that in the twenty-first century, a course or career on this subject in unacceptable, not because of the subject but because of the practice: there will be hundreds of “exorcists” trying to chase the evil out of hundreds of individuals. And we know about stories of people killed during an exorcism ritual. Imagine hundreds of people being “exorcized” by these “professionals,” spreading superstition and magical thinking and perhaps causing damage to innocent people who will abandon scientific medical treatments because they think their illness is caused by evil possession. The scientific community should be alerted, and it should be reacting to this dangerous nonsense. Until now, scientists remain in silence. It certainly is a big mistake.